Alberta: Provincial entomologists Scott Meers and Shelley Barkley have run the Alberta Insect Pest Monitoring Network for a few years. Input from canola producers and agronomy specialists would help in their tracking of bertha armyworm, cabbage seedpod weevil and cutworms. For bertha armyworm, Meers and Barkley are targeting at least five locations per county. Cooperators are especially needed in east central Alberta and the Peace region. All monitoring equipment is provided. Contact Scott Meers at Scott.Meers@gov.ab.ca or call/text 403-650-2674. Manitoba. Insect reports from farmers and agronomists are compiled to produce the weekly Manitoba Insect and Disease Update. Farmers and agronomists are encouraged to send in reports of building populations of insects, incidence of insecticide use to control crop feeding insects, or other interesting information. Contact John Gavloski at John.Gavloski@gov.mb.ca or 204-745-5668 (office) /204-750-0594 (cell). Saskatchewan. 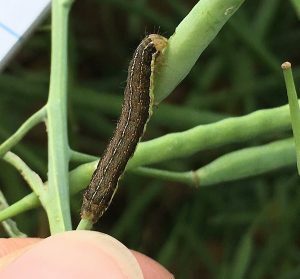 Provincial insect management specialist James Tansey gathers reports from regional specialists and gladly accept direct reports from growers and agronomists. Contact James Tansey at james.tansey@gov.sk.ca or 306-787-4669.